» Other News » Woking is a town born to be wild! Woking is a town born to be wild! ON THIS evidence, it is clear that Woking is a town born to be wild! The WWF-UK headquarters’ home town was brimming with leopard print leggings, tiger-striped ties and wild onesies on Friday in support of the annual Wear it Wild fundraiser. Jubilee Square was one of hundreds of sites throughout the country where people unleash their wild side to raise vital funds for wildlife and the natural world. 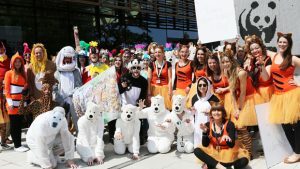 Local schools, businesses and residents joined the world’s leading environmental organisation to parade their animal-themed fancy dress in a fun packed afternoon. Charlotte Bagg, WWF-UK spokesperson, said, “It was great to see so many local residents, schools and businesses signed up to Wear it Wild once again this year. Figures from the WWF show that global wildlife populations have declined by half in the last 40 years, including iconic species such as rhinos, polar bears, lions, elephants and tigers. With three rhinos poached per day, supporting conservation work now is more important than ever. Last year, thousands of WWF supporters around the country showed their true colours in an effort to turn this worrying trend around and save some of the planet’s fastest disappearing species. And this year, tiger numbers rose for the first time in conservation history, showcasing how such efforts can make a real difference. Organisations like the WWF have the knowledge and tools to change these declining species trends, but it’s critical to act now to ensure these iconic species are not lost for good. Charlotte added: “We know many people care deeply about the plight of species such as tigers, rhinos and other creatures under threat.